In just three days my sweet rascal Caleb will be six years old - the years have flown for sure! We will be expressing how thankful we are for the amazing gift of Caleb as we celebrate his birthday lunch on Sunday after church - his choice is pizza and chocolate cake; so today I'm sharing with you the recipe for chocolate cake I will use when I bake his cake tomorrow. 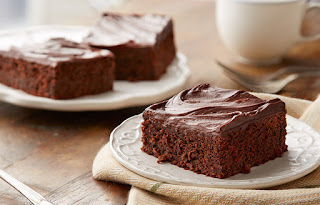 I found the recipe on the Hershey's Kitchen site - it has to be a great recipe . . . it is for chocolate cake and is from Hershey's kitchen!!! You will find the recipe at this link - if you have a birthday coming up, give it a try . . . or to brighten your day and the day of the people you love, give it a try! Happy Birthday to Caleb! I'm sure the cake will be delicious!